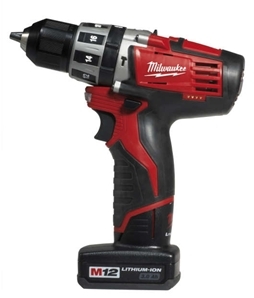 Milwaukee C12 PD32 M12 2 speed percussion drill driver, with new style 12v Red Lithium Ion batteries. The 3Ah deliver a much higher run time and increased durability. It is now possible to see how much life you have left in your battery due to the Fuel gauge displaying the remaining charge state.